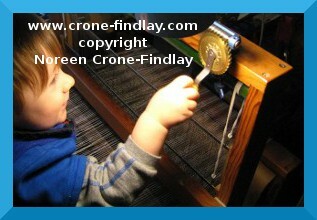 When should a child start learning how to weave? It’s never too early, (or too late!) for a child to start learning how to weave. I bought my daughter her first loom when she was 6 weeks old. It was a little Spears loom #2 from England. And, when my daughter and son were little, I had several looms set up for them to weave on, whenever they felt inspired to weave. 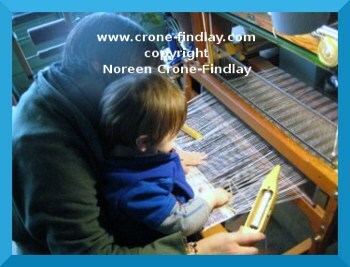 He’s been sitting in my lap at the loom since he was born, and he really gets what weaving is all about. He’s two now, and he KNOWS about the shuttle! He demanded the shuttle, and put it into the shed, and helped it across with his beautiful little chubby hands…. His grampa will certainly feel the love that has been woven into this shirt! 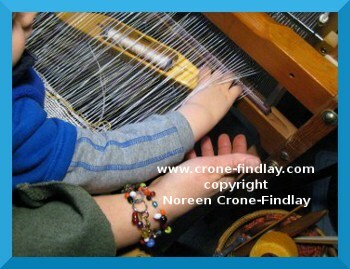 What do I recommend about teaching children to weave? You don’t need a loom to start teaching a child to weave- cardboard looms and foam meat trays are great. BUT- I DO NOT recommend trying to teach a child to weave with loopers on the potholder loom. Loops are actually rather challenging to work with. 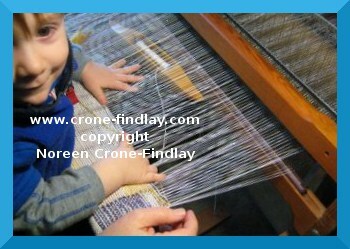 Yarn is much more user friendly, and I have all kinds of YouTube videos to help you get children weaving. and scan down to the bottom of the page, you will find all kinds of YouTube links for my video tutorials. and Weavagarumi for beginning weavers. So, go ahead, and get those kidlets weaving! It’ll be the gift that keeps on giving, as they will be embarking on a magnificent voyage of discovery that will last their lifetime! Lucky little one to have such a gifted teacher! Children who are exposed to art in all its forms have lives and brains enriched in ways we can’t even understand fully. All my own creative childhood memories are still very precious, as are the memories of the art my son and I created when he was little. I agree- children NEED to make art and craft! And- we benefit enormously by making art with them! I think that the lovely memories that we create when crafting with children are one of the dearest gifts that we carry with us through our lives. I learned to weave as a very young child. Had a Swedish gramms who brought her loom with her to this country. I could read a pattern and thread a loom long before i was tall enough to reach the treadles. When i was about 8-9 she would save me the last few inches of warps to play with. Somewhere i still have the very first towel i wove all on my own. Grew up thinking everyone made all their linens. What wonderful memories, Maggie! Did you inherit your grandmother’s loom? That would have been wonderful!